"Gravestones may be simple upright slabs with semi-circular, rounded, gabled, pointed-arched, pedimental, square or other shaped tops. During the 18th century, they were often decorated with memento mori (symbolic reminders of death) such as skulls or winged skulls (called "death's heads"), winged cherub heads, heavenly crowns, urns or the picks and shovels of the grave digger. Somewhat unusual were more elaborate allegorical figures, such as Old Father Time, or emblems of trade or status, or even some event from the life of the deceased (particularly how they died). 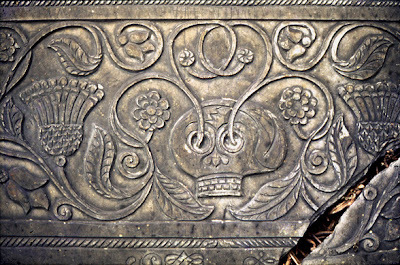 Later in the same century, large tomb chests or smaller coped chests were commonly used by the gentry as a means of commemorating a number of members of the same family. In the 19th century, headstone styles became very diverse, ranging from plain to highly decorated. They might be replaced by more elaborately carved markers, such as crosses or angels. Simple curb surrounds, sometimes filled with glass chippings, were popular during the mid-20th century. * IHS - Stylised version of iota-eta-sigma, a Greek abbreviation of Jesus"